Before this FOREO Luna 2, I use to be a religious facial cleansing brush user (you know that if you’re an old reader). You might’ve noticed as well that I’ve been a user of LUNA play. I use that only when I’m traveling. To be honest I never felt the urge to get myself a full-size LUNA facial cleansing device. Are you wondering why exactly? – because I never tried this luna 2 before on my face. 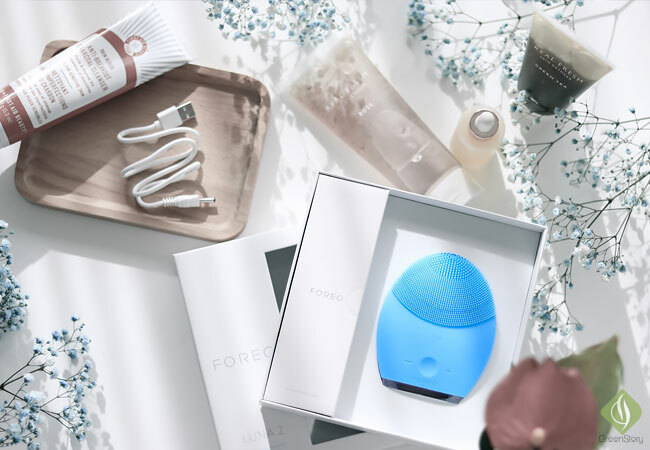 That feeling is long gone now since (courtesy of FOREO Malaysia) I started using this facial cleansing device by FOREO call LUNA 2. Tini-tiny silicone tooths of LUNA 2, its touch point and FOREO’s signature T-Sonic mechanism altogether feels mysteriously comfortable on the face. Alongside it does the cleaning job just perfectly. The blue color of my LUNA 2 is its code of skin type, combination skin. I like this fact that LUNA 2 has five different colors (including the Black for men) that specifically made for each skin types. LUNA 2 by FOREO – what is this device? It’s ‘not-a-cleansing-brush’ looking facial cleansing device plus the anti-aging super girl at the same time. LUNA 2 is completely waterproof and portable. Yes, it is rechargeable like the original LUNA and has a delightfully long battery life. – can you believe that?! This 2-in-1 beauty gadget is made of medical-grade silicone that makes it bacteria resistant and super easy to keep it clean. Little tooth like bristles (picture above) on the cleansing side are made according to each type of skin need. The opposite side of the cleansing part (picture below) is the anti-aging side LUNA 2. Anti-aging mode of it gives a soothing pulsation which is quite different than the cleansing mode pulsation. According to FOREO, lower-frequency pulsation of LUNA 2 anti-aging mode helps to visibly diminish the age sign. Because it makes sure that the skin is getting most out of whatever skincare product you’re using with. LUNA 2 power button is programmed to do all the job. The device turns on with one tap, stay on for 3 minutes per (one use of cleansing plus anti-aging) session. The cleansing mode works on 1-minute cycle and one minute for the antiaging message. In between, with a tap, the device will be in a pause mode. LUNA 2 also pulse on 15sec while cleansing and 12sec while massaging as a note to change the working zone of the face. Both cleansing and anti-aging mode pulsation strength are adjustable in 12 level. Hence there is literally no way this beauty gadget with cause you any discomfort. Generally, I take the time to deep clean my face every night. From cleaning sunscreen to make up everything happens to me at night. It’s is kinda rare during the day when I feel like to deep clean my face. That being so I was using LUNA 2 once a day for the past months. I’ve also been trying it with various type of cleansers, from a gel to foam to cream to mud. …haha no, no; I didn’t go crazy. I always prefer gel formula for a cleanser but you know how #bloggerlife goes! Found out that LUNA 2 works the best with a gel type, to say widely, thin type cleansers. This cleansing device doesn’t hold water like a normal brush would do. So for those cleansers that are thick and meant to foam up aren’t really easy to work with. I had to later up the cleanser before using the LUNA 2. Other than that facial cleansing with LUNA 2 feels like that cozy evening breeze after a rough day. No matter whatever amount of makeup was there in my face this cleansing device takes all off within a minute. Certainly, having the roomy option of T-sonic pulsation adjustment in LUNA 2 made it more worthy. I keep it a tad up from the mid-level, 7th or 8th intensity. Sometimes when my skin acts weird I simply lower down the pulsation intensity. Are you aware of the benefits of facial massage? Whether it’s the hand, in the spa or by a beauty gadget; a regular face massage routine will always return back healthy and glowing skin. Apart from serums, just recently I’ve been enjoying facial oils to use with LUNA 2 anti-aging mode. It does work way better and faster buffing the oil into the skin. My fingers or the Gua Sha Rose Quartz Heart Stone thingy I’ve doesn’t even work anything near. The antiaging mode of LUNA 2 is instructed to gently massage/stimulate on the wrinkle prone areas only. After a quick 1 minute anti-aging treat on my smile lines, temples, neck and decollete I follow up my eyes with FOREO IRIS. Oh yes, my FOREO army is pretty strong! If you’re with GreenStory in my social media then you must’ve noticed that IRIS eye messenger is my good old skincare buddy. Too bad that I’m yet to talk about IRIS here in the blog, maybe soon! That’s it, I finish off my PM skincare with a moisturizer. A little note, the night I use my FOREO UFO Smart Mask I skip using the anti-aging mode of LUNA 2. Is this facial cleansing device, LUNA 2, beauty device worth it? One of my friends is an old user of FOREO LUNA. I’ve been a Clarisonic lover ever since. She always told me she would always pick LUNA over a brush. Apparently I never really got her point which I know now. – this was such a major relief! Buying replacement brush heads always gave me that feeling of paying installment even after paid the full! 😂 Jokes apart, if you want to invest in a cleansing device, clearly, LUNA 2 well worth it. Then the anti-aging messenger mode of LUNA 2 will be an added bonus. Additionally, if you consider the 2-year warranty and 10 years of the quality guaranty the price of LUNA 2 feels smooth enough. I was feeling, using the same device for 10 years is gonna way to boring, it’s not a TV after all 😅. Confused which LUNA you should get? As because I’ve been using the LUNA play before (plus my hands are petite) so initially size and shape of LUNA 2 felt bizarre. After a couple of use, it started to feel handy. I’ll sound stupid if I compared LUNA 2 with the Play one! Straight out, LUNA Play is sort of play-thing considering the effectiveness of LUNA 2. Also just recently I got the LUNA fofo (a ‘real’ virtual reality. Man, future is indeed here!) which surely going to replace my LUNA play but not my LUNA 2. If you ask me which FOREO LUNA type I would recommend the most – LUNA 2, without a second thought. No complaint and actually very satisfied with this facial cleansing device. LUNA 2 is something that makes my beauty routine a bit easier and faster to cope with a busy life. I believe with the time my skin might start showing visible anti-aging improvements as well. Are you using any FOREO skin care gadget? Any other facial cleansing device you using and loving? Share your opinion and experience in the comments below. Available to purchase at Sephora stores and online. You can also buy them directly from the FOREO website [20% OFF sitewide with code ‘GREENSTORY20’].